Join Us For Awesome Door Prizes, Delicious Food & Exclusive Discounts At Our Fall Trunk Show! Don’t miss this highly anticipated event of the season. 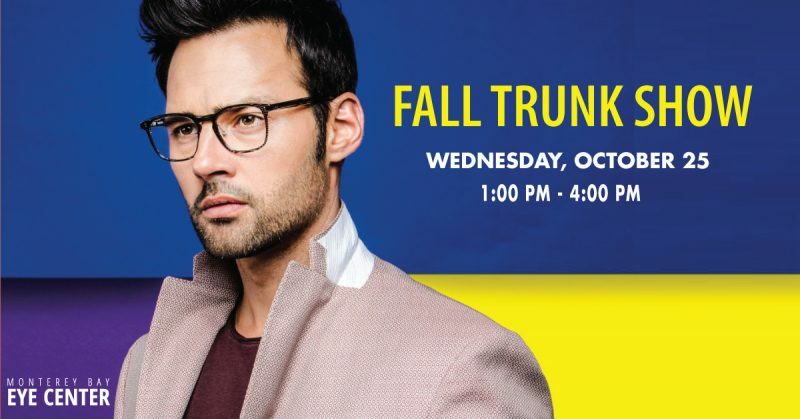 Enjoy special deals on all of your favorite eye wear brands, including JFRey, Tura, Bobbi Brown, and more on Wednesday, October 25, from 1:00 PM- 4:00 PM. In addition to these exclusive specials, we will also be serving mouthwatering food and giving away awesome door prizes to lucky participants. Call 831.275.5130 to learn more about this amazing event. Patients are encouraged to contact the MBEC physician on-call for any after hour emergencies before going to the nearest emergency room. Prescription refills and routine problems will be addressed during regular business hours. If you would like to schedule a consultation with one of our eye care specialists, please take a moment to fill out the electronic form below. We will be in touch with you as soon as possible to schedule a consultation. ©2015 Monterey Bay Eye Center. All rights reserved.